The Town Hall Building is located at 45672 Main Street. Office hours are Monday through Friday 8:30 a.m. to 12:00 p.m. and 1:00 p.m. to 4:30 p.m.
Jason Miller is the current Mayor for the Town of Concrete. 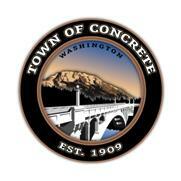 The Concrete Town Council meets on the second and fourth Mondays each month at 6:00 p.m. in the Concrete Town Hall Building located at 45672 Main Street.